Good news—Aunt Josephine is still alive. At least, she was. For a bit, anyway. Not so much anymore though. I suppose it’s possible she somehow escaped the leeches (Snicket’s comment that the Baudelaires hoped Josephine was alright at least offered a possibility she might be), but I wouldn’t hold my breath. This is because holding your breath for too long can be bad for your lungs, and is also not effective protection against extremely hungry leeches. “The Wide Window: Part Two” finds the orphans once again left to their own devices against the ongoing machinations of Count Olaf. Mr. Poe returns to be his usual useless self, and while the episode’s final scene has the first significant break in story structure that we’ve seen yet (with Violet, Klaus, and Sunny going off on their own), there’s a lot of same old same old to get through before we move on. This is disguised with a goofy action set-piece and some help from Larry The Waiter, but the fatigue is noticeable. It’s not that “Part Two” is filled with bad jokes or sloppy performances. (I continue to think Alfre Woodard’s barely constrained hysteria works great, and the usual gang of misfits is still doing strong work.) It’s more a combination of a lot of little things that add up to drag down what otherwise would be excellent—if terribly sad and awful and heartbreaking—storytelling. There’s nothing wrong with a solid running gag, and, on their own, the ones that make their appearance here—from Snicket’s word definitions to Olaf’s inability to stay in character to Mr. Poe’s general uselessness—are all fairly funny. Olaf and Poe being buffoons is a good joke in part because they are so obviously doltish that the obviousness becomes part of the joke, and if that works for you, it’s not something that’s likely to get old any time soon. But you combine the same old jokes, effective or not, with a lot of the same old plot, and things start to drag. I found it harder to pay attention to what was happening on screen, even when it was exciting things like hurricanes and leeches and setting fire to scarves, and it’s my job to pay attention, so that’s not good. 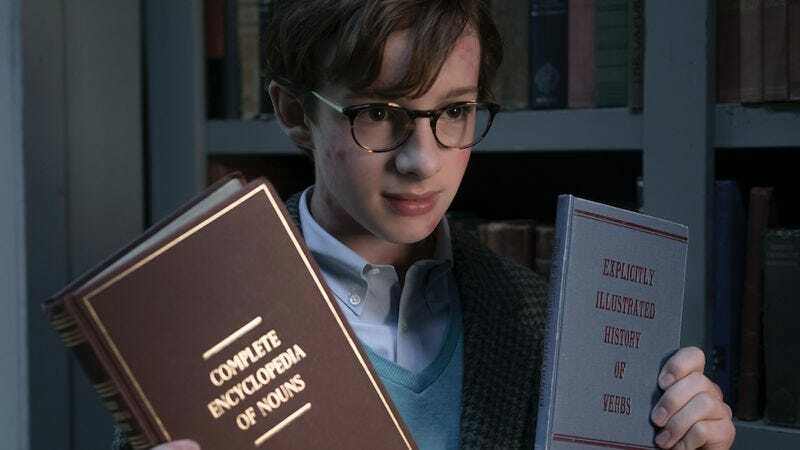 So much of “Part Two” is spent with the Baudelaires struggling to get an adult to listen to what is clearly the truth that the frustration quickly gives way to boredom. We know that Mr. Poe won’t recognize Captain Sham’s real identity until the end, and while it’s possible to sympathize with Klaus’ and Violet’s growing frustration, that sympathy doesn’t make for gripping viewing. There are variations here. Larry The Waiter at the Anxious Clown Restaurant makes another appearance, serving under duress and doing the best he can to help the kids. (“Best he can” here is a phrase that means “not all that much, although nice work on the peppermints.”) There’s some novelty in Klaus’ efforts to decode Josephine’s error-ridden suicide note, and the fact that Josephine is still alive and hiding in the Curdled Cave gives the Baudelaires a way to take action while Mr. Poe and Olaf dither over details. Plus, there’s some dramatic complexity in watching Violet and Klaus attempt to negotiate with Josephine; she’s not a villain, but she’s also not the hero they need, even if she’s just slightly more self-aware than Mr. Poe. I think I’ve already used the word “Kafkaesque” in these reviews, but it’s something I keep coming back to. While it may not always make for the most dynamic conversations, there’s something conceptually fascinating about the way Handler’s writing takes the expected elements of kid lit and tweaks them just enough to underline the nightmarish elements in so many children’s stories. “Part Two” is definitely the scariest entry we’ve had yet, at least in terms of immediate threats. While Olaf’s knife-work has always been suggestive, nothing in his repertoire has had quite the impact the Lachrymose Leeches. The scene of them tearing apart a sailboat in the middle of the lake is surprisingly graphic; not in terms of blood and gore (of which there is none), but just the design of the creatures themselves, and their utterly merciless assault. Bringing them back later to devour poor Josephine isn’t exactly a shock—given what happened to Monty, it’s no surprise how far Olaf is willing to go to get what he wants—but there’s a certain straightforward cruelty to her death that helps provide gravity to the rest of the story. No matter how many words Lemony Snicket defines, or how bad Olaf’s disguises get, there are still actual consequences here. Yet those consequences don’t always translate smoothly into tension, because the show isn’t always great at finding good ways for the kids to escape danger. Eating the peppermints to cause an allergic reaction? That’s good, and pays off something set up last week; it involves a certain amount of braveness and sacrifice. Surviving a hurricane that literally breaks the house they’re standing in? Well, Klaus’ contortions were silly, and no matter how close he got to the ledge, it never seemed like any of the children were in real danger. But it was visually impressive and didn’t require any extravagant narrative contortions to escape. But using light from a lighthouse to set a scarf on fire is a bit of stretch, especially factoring in an inadvertent assist from Mother and Father in a plane overhead. I’m being nitpicky, but while it was nice to see Mother and Father briefly connected with the main action, something about the whole set up just didn’t quite sit right with me. Maybe it’s more a reflection (ha!) of a discontent with the episode on the whole; it’s not bad, really, but it’s hard to shake the feeling that it could’ve been better. Other than that, the main development to mention, and one of the entry’s stronger creative decisions, was Klaus, Violet, and Sunny finally deciding to get proactive about their hunt for answers. During the collapse of Aunt Josephine’s house, Klaus is able to snag a photo of a group of smiling people which includes Josephine, Monty, Larry, and the Baudelaire parents, among others. This evidence of happier times was shot outside the Lucky Smells lumbermill, and when the children see a truck headed there at the end of the hour, they decide to hitch a ride while Mr. Poe is trying to catch up on current events. 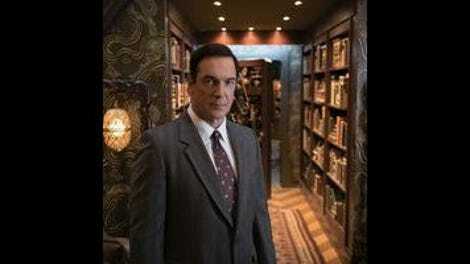 The break in routine is significant, and while I have no doubt Olaf will be following close behind, the fact that the Baudelaires are taking matters into their own hands now will hopefully provide some energy as we head into the final segment of the season. So, while Mother and Father are definitely in the picture that Klaus finds, and while Klaus tells Aunt Josephine that the Baudelaire parents are in the photo, it doesn’t seem like much of a leap to guess that the couple Klaus is referring to are the ones standing next to Will Arnett and Cobie Smulders. I’m not basing this off of any official info, so I don’t think it counts as a spoiler; just, it would be entirely in keeping with this show to set up a twist like “Mom and Dad aren’t dead after all,” only to pull the rug out from under us at the last moment. “Yes, by some strange coincidence, he called me accidentally, trying to reach a knife store to buy a surprise for some children he knows.” -Mr. Poe, continuing not to get it. Shout out to the cab driver who’s obsessed with Melville. He doesn’t add much to anything, but still, always good to recognize the classics. Larry gets a call about Mother and Father, although the information doesn’t appear to do anyone much good. Josephine decides to stand up for herself and stop being afraid at the worst possible time. It changes the moral of her story slightly. You can’t just suddenly choose to be brave and expect your courage to protect you. Also, maybe don’t stand in front of the open section of the boat railing. We head to “The Miserable Mill: Part One” on Wednesday. I strongly recommend you make alternate plans.